Participation in music is a recognized predictor and indicator of student success in and after high school. When you choose to enroll in the bands at May River High School, you will rub elbows on a daily basis with other students passionate about success, both academically and artistically. Simply put, you will be joining a family that values excellence as a standard operating procedure, and that pursues excellence with passion, no matter what the endeavor. In the last 18 months, the band program has grown over 200% from 23 members to over 75 members. 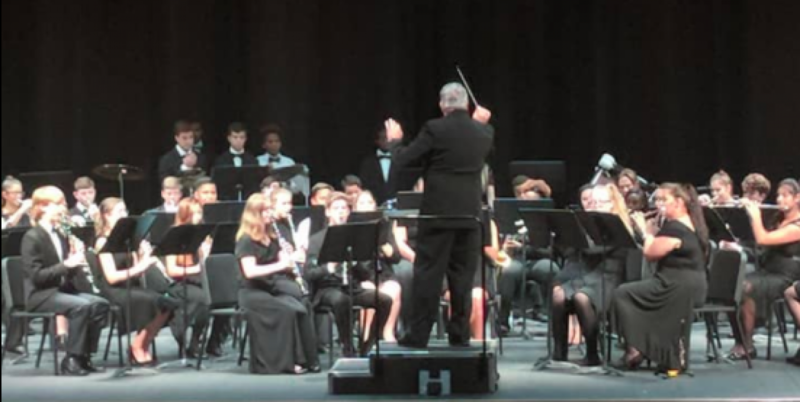 Next year we anticipate the band program to be over 100 members strong, making the May River HS Band the largest organization in the school, and the largest band program Beaufort County has seen in over 20 years. An an average high school with a strong performing arts program, 16% of the student body participates in performing ensembles and almost half of the Top 10% of the graduating seniors participated in one of those ensembles. What does that mean? It means because your student participates in music, they have a much better chance at doing well in school, period. This has been researched over and over, and the results are mind boggling!!! There is virtually ALWAYS a way to fit band into your schedule, despite what it may look like at first and regardless of what academic track you choose to pursue – standard, Honors, and / or AP. The guidance department at MRHS are the best, and they are very supportive of the band program and the fine arts. Again, we look forward to seeing you at our “Baby Shark” Band Night on Thursday, February 21st from 6:30 to 7:30pm. In the meantime, feel free to download our Band Informational Pamphlet, as well as our Band Introduction Letter. Continue reading below regarding SUMMER BAND so that you can best plan your summer vacations. We look forward to having you in the program next year! Please feel free to contact us at any time! Summer Band Camp tentatively begins on July 22, 2019. The tentative band camp schedule can be found in more detail on the calendar page. Band Camp is considered MANDATORY and is REQUIRED FOR PARTICIPATION if a student would like to be eligible for inclusion in the competition show. Monday, July 29th through Thursday, August 1st – FULL BAND CAMP – week #1 – all sections – MANDATORY– 7am – 5pm. If you have any questions, please do not hesitate to email Mr. Carbone at david.carbone@beaufort.k12.sc.us.